SATO Tatsuya, KITAOKA Akiyoshi & TSUCHIDA Noriaki (Eds.) 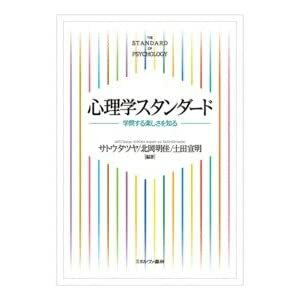 "The Standard of Psychology: Finding Pleasure in Studying"
SATO Tatsuya, KITAOKA Akiyoshi & TSUCHIDA Noriaki (Eds.) April 10, 2014　Minerva Shobo, 288p. This is a textbook written by leading professionals of each field of psychology for readers who study psychology seriously. This book covers orthodox fileds of psychology-- "clininal," "developmental," "perceptual/cognitive," and "social" psychology. Moreover, it has commentary of "frontier topics." This book provides average knowledge of psychology based on the latest research achievements. This book can be used for entrance examination for graduate schools. １ What Is Clinical Psychology/Psychotherapy? １ What Is Behavioral Therapy/Cognitive Behavioral Therapy? Chapter ３　Disability/Barrier Free （MOCHIZUKI Akira）: What Is Adequate Assistance for Symbiosis? ２ Research on Barrier Free Aimed at "Wheelchair Users"
１ How Is the Brain Made? ２ What Are the Brain's Activities? ６ How Is the Physical World Converted into the Psychological World? １ Why Can't We Solve Problems? ２ Why Can't We Answer Logically? ３ Why Can't We Make Good Decision? Column　What Is a Rational Thought? １ Pavlov's Dogs: How Did Dogs Come to Salivate? ２ Skinner's Pigeons: How Did Pigeons Come to Peck at Keys? Column　How I Stopped Worrying and Made Goldfishes Push Underwater Panels? Chapter 13　Personality（Theory/Examination）（OSHIO Atsushi）: How Is Personality Represented? Chapter 17　Juvenile Justice and Clinical Psychology（HIROI Ryoichi）: Approach of "Clinical Justice"
Column　Health Education by Using Games "Health Enhancement Games"